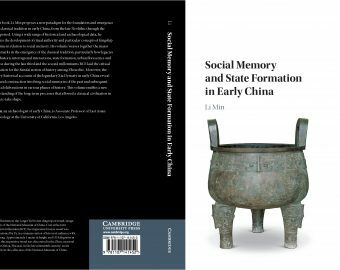 Li Min’s book, Social Memory and State Formation in Early China, is released by the Cambridge University Press in summer 2018. 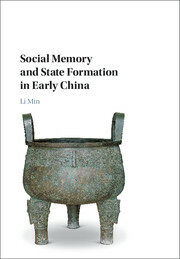 In this book, Li Min proposes a new paradigm for the foundation and emergence of the classical tradition in early China, from the late Neolithic through the Zhou period. Using a wide range of historical and archaeological data, he explains the development of ritual authority and particular concepts of kingship over time in relation to social memory. His volume weaves together the major benchmarks in the emergence of the classical tradition, particularly how legacies of prehistoric interregional interactions, state formation, urban florescence and collapse during the late third and the second millenniums BCE laid the critical foundation for the Sandai notion of history among Zhou elite. Moreover, the literary-historical accounts of the legendary Xia Dynasty in early China reveal a cultural construction involving social memories of the past and subsequent political elaborations in various phases of history. This volume enables a new understanding on the long-term processes that enabled a classical civilization in China to take shape. ‘This book provides a long-awaited archaeological perspective on the genealogy of knowledge in spatial, temporal, technological, and formal representations involved in the Wen Ding narrative as a historical palimpsest. It is an especially challenging one that few scholars would take on. The approach is uniquely creative resulting in intriguing interpretations about historical and archaeological data from the late Neolithic to the Zhou periods. It is a cutting edge and, in many ways, bold and innovative study that will quickly take its place as a seminal contribution, not only for the history, archaeology, and anthropology of China, but much more broadly in both the social sciences and in the humanities.’ John Papadopoulos, University of California, Los Angeles.